A new tool that rates the environmental features of multi-unit residential buildings will help reduce Australia's greenhouse gas emissions while delivering health benefits and financial savings for occupants, said the Green Building Council of Australia (GBCA). Specific to the residential sector, the tool assesses the energy and water efficiency of appliances, control of lights and air conditioning in unoccupied spaces, universal design and the provision of communal facilities. While the green rating tools available for offices incorporate energy modelling consistent with the NABERS Energy tool, equivalent modelling did not exist for the multi-unit residential sector, so the residential tool also includes a customised energy calculator. United Spinal Association (www.UnitedSpinal.org) has released an updated version of the Accessible Air Travel -- A Guide for People With Disabilities with expanded regulations for the Air Carrier Access Act -- the law that mandates air travel accessibility for people with disabilities -- which took effect May 13, 2009. This helpful booklet informs individuals with disabilities of their rights as passengers on commercial airlines and how to adequately prepare to ensure their air travel experience is enjoyable. It also provides valuable insight on a multitude of air carrier procedures, such as information about requirements for foreign airlines, what to expect in terms of equipment liability, how to file a complaint, and airport screening requirements. "This guide has been a very useful resource to thousands of air travelers over the years that were not aware of their rights under the Air Carrier Access Act. It is our hope that this revised version continues to help people with disabilities across the country experience enjoyable and trouble free air travel," said Kleo King, senior vice president of Accessibility Services at United Spinal Association. To obtain a free copy, please visit www.UnitedSpinal.org and click on the "PUBLICATIONS" link. International Paralympic Day 2009 (IPD) will take place in Berlin on 11 July. It will be held at the Brandenburg Gate. A crowd of more than 40,000 attended the event in 2007. Said IPC President Sir Philip Craven: "The International Paralympic Day 2009 presents a unique opportunity to experience exciting Paralympic sports and inspiring Paralympic athletes at their best." Athletes will come from all over the world to perform in Berlin. So far, the following athletes have confirmed their attendance: for Wheelchair Basketball, the German Women's National Team and the Dutch Women's National Team; for Table Tennis Paralympic Gold Medalist Holger Nikelis, and for Biathlon Paralympic Gold Medalist Verena Bentele. World-class athletes Casey Tibbs (USA), Paralympic medalist in Beijing 2008, and Urs Kolly, Paralympic Champion in Athens 2004, will also be present and compete in the main event of the day, the Long Jump competition. The audience, especially children, will have an opportunity to try out some of the sports themselves like Wheelchair Basketball or the Biathlon shooting range. Access to wireless services and technologies is vital to full participation in society for people with and without disabilities. Therefore, consumers are an integral part of the RERC's research, development and training efforts . Wireless RERC (Rehabilitation Engineering Research Center) has become a recognized leader on issues and solutions related to the accessibility and usability of mobile wireless products and services by people with disabilities. The Wireless RERC's mission is to promote equitable access to and use of wireless technologies by people with disabilities and encourage the adoption of Universal Design in future generations of wireless devices and applications. Here, links are provided to Wireless RERC's projects focusing on consumer needs. This project's goal is to develop an online resource (mywirelessreview.com) for disseminating usability testing results to consumers, wireless product manufacturers, and retailers of mobile wireless devices and services. This project collects information about issues of access and usability of cell phones and other personal wireless products from the perspective of people with disabilities. This project promotes the awareness of accessibility among consumers and wireless providers, including retail sales staff. The Survey of User Needs helps us understand how people with disabilities use wireless products like cell phones and text messengers. We hope you will take the time to share information about your needs with us. In order to keep our Consumer Advisory Network participants informed on our progress, we mail out our quarterly Consumer Advisory Network Newsletter. Your Guide to Choosing a Cell Phone was developed and tested by the Wireless RERC's Consumer Advisory Network to help persons with disabilities in choosing a phone to meet their needs. Indiahotelreview.com has launched a new plan of tourist friendly Destination Charts and Standard Maps to make Indian destinations more attractive and accessible to travellers. Announcing the plan, IndiaHotelReview.com executive Ankit Rastogi said that these Standard Maps and Distance Charts are to be an integral feature of every destination showcased in the IHR Travel Guides. Ankit commented on the launch, "Once you have arrived in a destination the most common question that is in everybody's mind is what to see. "This assertion of ours is based on the overwhelming number of questions we get daily in our Travel QNA section." He continued, "The web is flooded with sites offering maps to the travelers, but even a cursory look and you will feel that they are not reader friendly, loaded with all the details geographical or otherwise but these hardly appeal to an average tourist looking for easy information. "Our Maps and unique distances chart are simple tools to assist the travelers with a clear cut idea about the standard set of places to visit. "The whole idea is to make traveling easy for the masses and bring them a step closer to the destinations. "Ankit" said. "To cite an example, Coorg is an important destination in the tourist map of Karnataka, a lot of confusion persists in the mind of tourists on how to approach Coorg. "Starting right from the different names of Coorg, to the right order of visiting the various sightseeing locations. "Our distance chart is tailor made specifically to show all the important locations from Madikari, the headquarters of Coorg district. "Our endevaour to have maps and distance charts for places is in many ways pathbreaking, no travel website including the big guns have thought this way to facilitate a hiccups free traveling." New Zealand seems hardly aware of how major demographic changes will impact our tourism industry. of people with disabilities (PWDs). company will continue to target them because they have more time and money. Life because "they offer facilities for the disabled". aged 15 to 49 are expected to remain at 2007 levels. before (See IT639, IT699, IT705, IT739). - think development of port facilities - it is over 70 percent. backpackers market as an industry lifeline. each of its nine rooms are wheelchair accessible, a trademark of the builders, Easy Access Development, a local company that makes all of its projects "wheel-chair friendly." Debbie Quigg, one of the owners, says that while the ADA requires large hotels to accommodate for people in wheelchairs, it isn't often that small bed and breakfasts do. "A lot of times at cute, quaint places like this it is hard to find wheelchair accessibility," she says. 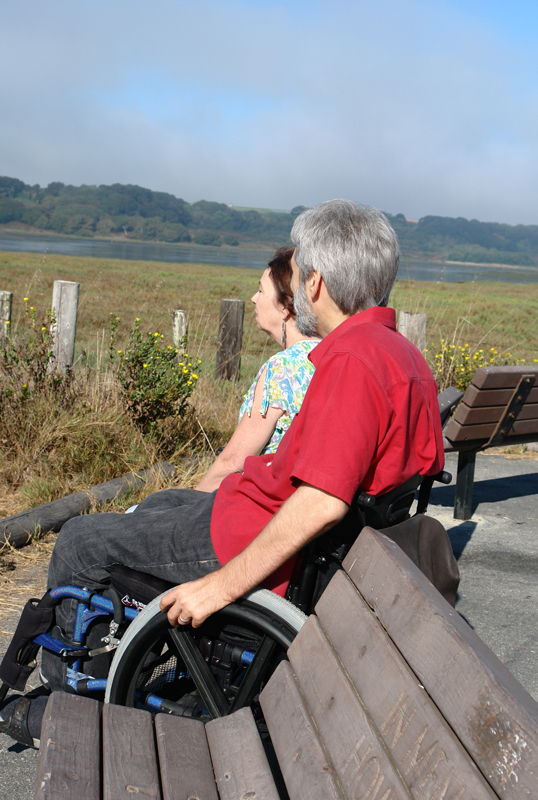 And she would know - she and her husband Joe are both in wheelchairs, and started Easy Access Development after moving to Santa Cruz eight years ago and having difficulty finding places that were accessible. Their mission with Easy Access Development was to make accessibility a priority in all of their projects. "We wanted to invest our money in a way that was benefiting society as well as making money, and we made the decision that everything we did was going to be wheelchair accessible," says Joe. Although they have yet to draw in any guests in wheelchairs, they are happy to know they are providing the option. Over the last 30 or 40 years, leaders in the disability rights movement have become well aware of disability in the frame of Human Rights. With the entry into force of the UN Convention on the Rights of Persons with Disabilities, the first human rights document of the 21st century, the entire world has finally become aware that part of its population does not have any access to their fundamental rights as human beings. Society has taken a long time to recognise and it will take yet more time to implement the changes that are needed. We, disabled people, will persevere and we will be pragmatic. We will continue to articulate our needs and rights and we will ensure that all disabled people will have the freedom to enjoy their rights. More than an obligation, living with disabled people is also a resource and not only an obligation, and we know that by accommodating disabled people society as a whole benefits. When we are included, we disabled people became more differently able and can be resources more than charges. Inclusion is better for everybody, solutions for us are facilitating efficiency of everybody and our creativity empowers the society. The implementation of the CRPD is a great opportunity for the society at all, and knowing that ?living together is based on doing together? () the best way to learn how to live with each other is to establish partnerships on an equal basis. DPI Europe has the ambition to start to define the principles and the rules of these partnerships. In DPI, we believe that the people who represent disabled people must be disabled people themselves and not others. We believe this because as disabled people our life experience has shown us that self-representation is the only way forward. It is the time to make our slogan ?nothing about us without us? a reality in all spheres of life. We must ensure that today?s concept of ?participation? becomes a reality tomorrow. In the negotiations for the UN Convention, the participation of disabled people was central. In all the negotiations disabled people were accepted at full partners. We now have the opportunity to turn all the nice words into actions. Let us see positives instead of negatives. Come with us on this great journey of the last great Civil Rights Movement. os meios de transportes novos, o tempo limite de adapta? ?o é até 2011.
ter espa?os liberados ao lado dos assentos para os c?es-guia. um número enorme de cidad?os com dificuldades de mobilidade." In Vancouver it is 2010 Legacies Now and Measuring Up the North that carry the Paralympic Torch already - and will continue to be remembered long after the competition. Spain promises to join that team of global leaders. Simon Darcy documents the emergence of this maturity in sport trend in the study Benchmark Games on the 2000 Olympics. I have been impressed with the behind-the-scenes commitment to inclusion and the Paralympic spirit that is the legacy and passion of the Fondazione Cassa di Risparmio di Torino (FCRT.) A sustainable cultural toward iniclusion is possible with FCRT's sharp focus and their ability to identify, study, and disseminate best practices through their networks. The slideshow below gives a glimpse of their vision and impact. VisitEngland has recently refreshed the entry-level mobility standard of the United Kingdom's National Accessible Scheme, which enables accommodation providers to give a declaration of the accessibility of their business. The new standard, called 'One Step Ahead', is not so exacting as the requirements, for example, for full wheelchair accessibility. To read more about the scheme and download the One Step Ahead brochure, visit the One Step Ahead website. "A World of Solutions: Innovations for People with Disabilities"
"A World of Solutions: Innovations for People with Disabilities" is an initiative from the Science and Technology Division of the Inter-American Development Bank, that was launched on May 7th. We are looking to support the implementation of pilot projects that use innovation and technology to improve the quality of life and the economic and social inclusion of People with Disabilities in Latin America and the Caribbean. Financing (for up to US$ 50,000) is available to finance innovative projects to promote the social and economic inclusion of people with disabilities. The competition is open to Disabled People's Organizations, NGOs, businesses, foundations, research centers and universities in all IDB member countries. The selection criteria include: degree of innovation, impact on economic and social development, scalability and replicability, institutional capacity, and direct participation of people with disabilities. The deadline is June 30th, 2009. We would like to know which problems people with disabilities (PWD) face in the region. Our blog is an interactive site where PWDs, DPOs, and anyone interested in the theme can share, vote, and prioritize the barriers that are more relevant. The voting will be open until June 30th, 2009. After July 15th, 2009 we will open a competition of solutions for the problems that received the most votes. Scientists, innovators, creative people from all areas can participate in the competition, and the IDB will finance the development of the best ideas. "Un mundo de soluciones: Innovaciones para personas con discapacidad" es una iniciativa de la División de Ciencia y Tecnología del Banco Inter-Americano de Desarrollo que fue lanzada el 7 de mayo, donde queremos apoyar la implementación de programas piloto que mejoren la calidad de vida y la inclusión económica y social de personas con distintas discapacidades en América Latina y el Caribe a través de tecnología y soluciones innovadoras. Se pretende financiar (por montos de hasta US$ 50.000) proyectos innovadores que promueven la inclusión económica y social de personas con discapacidad. Pueden participar Organizaciones de personas con discapacidad, ONGs, empresas, fundaciones, centros de investigación y universidades de todos los países miembros. Los criterios de selección incluirán: el grado de innovación, el impacto en el desarrollo económico y social, la posibilidad de crecimiento o ampliación, la capacidad institucional y la participación directa de personas con discapacidad. El concurso cierre el 30 de junio de 2009. About one per cent of the cabins on new ships are usually accessible. "The new Royal Caribbean Oasis of the Seas will have more than any other ship - 46 accessible cabins," says Schwartz. That's 1.7 per cent of cabins based on the 5,400-passenger ship that's scheduled to launch this winter. "Cruise lines are also offering a wider range of categories for accessible cabins," says Schwartz. "They aren't just offering ones on lower decks or an ocean view cabin. There are accessible family suites and ones with balconies now." One of the Crown Loft Suites on the Oasis has its own private elevator to access the loft level of the 737-square-foot, two-storey stateroom. Home exchange is a great way for retirees to travel, and all swappers should welcome offers from flexible, mature retired people. But even if you are eager to exchange with older travelers, your home itself may deprive you of the opportunity to exchange with seniors. Whether senior citizens, small children or people with disabilities, many home exchangers may be unable to swap with you if your home is not accessible. Stairs, or even a few steps, are the prime culprit in denying access, but there are other hazards which can make your home unsafe or totally unusable for certain exchangers. A 25a Semana do Meio Ambiente de Porto Alegre que aconteceu entre os dias 4 e 10 de junho contou com várias atividades inclusiva. Uma delas foi a 3a Trilha Ecológica para pessoas em cadeira de rodas realizada pela ONG Caminhadores RS realizada no dia 07/06 no Parque Natural do Morro do Osso. é a terceira vez que essa atividade acontece dentro do calendário de eventos da Semana do meio Ambiente de Porto Alegre. The Senate agreed Tuesday to proceed to a tourism bill that is a priority for Majority Leader Harry Reid. The Nevada Democrat pushed the bill (S 1023) to the front of the agenda because of a decline in tourism that started after the Sept. 11, 2001, terrorism attacks and has since been exacerbated by recession. The measure would create a private company to advertise the United States as a tourist destination to foreigners. The company would be funded by private contributions matched by up to $100 million a year from the federal government. The bill also would establish assessments, including a $10-per-trip fee on foreign travelers, to help pay for the government's matching funds. "Other countries around the world spend millions of dollars promoting their countries," Reid said Monday. "The United States spends nothing. We should compete." People are economizing on travel expenses this year. They are looking for closer destinations and taking shorter holidays. And if you don't have a site like this one in your country why not do what Lianne Kalivati has done in New Zealand - start your own! This website provides information on the history of disability in movies. Designed as a teaching aid the approach is from Disability Studies approach. Note the Introduction and Ways of thinking about disability. Examine critically how commercial, Western - mostly Hollywood cinema, has portrayed disabled people. Develop some ways of thinking about disabled people from a human rights based approach as part of school's wider approach to equality. Looks at ways disabled film-makers and their allies have represented disability in non commercial films. It's stating the obvious to say that the Baby Boomer generation is aging - we're reminded often, thanks to the media. However, it is this generation - or more specifically, their situation and needs - that is paving the way for how the rest of us will prepare for the future. Some examples include how the country is approaching healthcare, longevity of careers and retirement planning. One of the more uplifting and interesting trends is how houses are designed, remodeled and laid out to allow for folks to age in their current homes. This is a trend known as Universal Design. According to Rebecca Stahr, ASID, CAPS, CSP, and president of the Universal Design Alliance in Atlanta, Universal Design is "a user-friendly approach to design in the living environment where people of any culture, age, size, weight, race, gender and ability can experience an environment that promotes their health, safety and welfare today and in the future." The Universal Design Alliance, you ask? They're not alone. There are more groups dedicated to this concept than you'd think. Chuck Nyren, author of Advertising to Baby Boomers, believes that without truly understanding the Baby Boomer mentality, marketing Universal Design can come off as condescending or a reminder of old age. However, he remarks that when marketed intelligently, "whether they know or not, the majority of Boomers would appreciate the benefits of UD." The specific design solutions used to create the first Emergency Room for seniors will not be identical with those used on a cruse ship or at a resort - but there is something to be learned by destintion developers, hoteliers, and travel professionals in this example of clarity of purpose and deep knowledge of the psychology and physiology of a client population. For a further discussion of this project read Seniors-Only Emergency Room at Silver Planet. Soon we hope to publish some of the proceedings of the Carlo Besta Italian National Neurological Institute conference on disaboity and tourism where medical professionals address the key insights here - that seniors and those with disabilities are living with chronic conditions. These conditions, because they are predictable and well-understood, can addressed through design. Notice in the video the comparisons to "home"; the attention to multiple sensory modalities; the consistent integration of designed space and services to the clearly understood functional ranges of those who will use the space. The same rapidly growing demographic described here are those who have made Universal Design the norm in their remodeled homes -- and who expect it in the transportation, food, and lodging establishments they seek out for leisure and travel. View more PDF documents from Scott Rains. way to get back on trail and to come up with the answers. Moving a large bureaucracy, like the European Commission (EC), into new areas of policy-making can be a rather slow process. Although the EC has supported "Design for All" initiatives for over 10 years, design as such is not an official part of the EU policy agenda. Now the Commission has launched a public consultation to gather opinions about making design an integral part of European innovation policy. A positive outcome to the consultation could lead to new EC funding programmes and initiatives in support of innovation through design - something which ENAT believes is much needed in the travel and tourism industry. The Public Consultation closes on 26 June 2009. The EC working paper provides an analysis of the rationale for making design an integral part of European innovation policy. The consultation questions are based on the document. Their aim is to find out whether more should be done at EU level in the area of design and if so, what. The identification and key questions are compulsory. The specific questions are optional and respondents may therefore reply to all, none or a selection of the latter group of questions. Respondents are however strongly encouraged to respond to as many questions as possible, to help ensuring the best possible results from the public consultation. To download the Consultation Questionnaire, visit the EC Consultation website. ENAT firmly believes that the "Design for All" approach and following the "Universal Design principles" are crucial to the delivery of tourism that is accessible to and inclusive of all citizens. Environments, facilities, products and equipment, Information and Communication Technologies (ICTs) and services in the travel and tourism sector must be designed to take into account the widest range of user requirements, including the needs of children, people with disabilities and older visitors. "User-centred" innovation can be the focus of a great deal of much needed development for many areas of accessible tourism, for example in accommodation, attractions, transportation, tours and all kinds of tourist activities. The ENAT association will respond to the EC consultation. We also offer the design experience of many of our members to further the European work on design for user-centred innovation. Are you concerned that your kitchen is not aging as well as you? Perhaps a family member who has moved in is finding it tough to get around your bathroom? If you've answered yes, we can help! In 250-words or less, write about the current physical challenges or obstacles you or a loved one have with your current bathroom or kitchen layout or design. The essay can be in body of e-mail or attached as a Word document (.doc). Attach three (3) photos of your kitchen or bathroom in need of the makeover. Images must be in .jpg, .jpeg, or .gif format no larger than 500KB in size. YOU MUST HAVE ALL THE ABOVE INFORMATION IN YOUR ENTRY TO BE CONSIDERED. There is a one (1) entry limit per household. The contest is open to owners of detached homes within the 50 states and the District of Columbia who are 45 years of age or older and closes at 11:59 p.m. on June 14 ... so hurry! Again, one bathroom and one kitchen will be selected to get a simple, low-cost makeover making them safer and more comfortable, without sacrificing beauty and style. Short Holidays in the US: Californa State Parks? Maybe Not! The 74.9 million people who visit state parks produce over $4 billion in direct spending associated with their trip, a new Sacramento State study has found. The findings are shocking researchers considering the state only invests around $70 million a year into the system. 2009, spent an average of $57.63 each. Over a thousand of those surveyed were non-resident of California, spending an average of $184.91 per person, or an estimated $1.66 billion. Spending included parking, camping fees, maps, tours, local food from grocery stores, gifts, restaurants and gas. One of LAist's favorite trips is Malibu Creek State Park where the drive probably costs $5, parking is $10 and a post hike meal at one of the best taco eateries in the county can easily run $12 a person. The state invests around $70 million a year into state parks and a proposed cut by Governor Arnold Schwarzenegger would close 80% of them for two years at a cost savings of around $140 million. "It's astounding how little the state puts into state parks," said David Rolloff, a professor with the university's Recreation, Parks and Tourism Administration, when reached by phone. "These are gems of California. It's what we identify with and one of our most valuable resources," Rolloff continued. "To make them unavailable is hard to imagine. Of course, the budget is hard to imagine." In a time when many Californians are looking for more local vacations, the closure of parks will severely affect their options. "We think that state parks fill a huge amount of that kind of demand, which has become a national trend where you're vacationing within a certain radius of your home," said Rolloff. "It's distressing to see [this budget proposal] when people are looking to stay closer to home." For more information on the survey, contact Professor David Rolloff, Recreation, Parks and Tourism Administration, at (218) 634-3304. For media assistance, contact Sacramento State's Public Affairs office at (916) 278-6156. Thanks to Coastal Habitat's Margie Whitnah for this post. *As people age they do not inevitably self-identify with a vibrant global community of people with disabilities because they see theirs as a "personal problem" - perhaps with a burden of shame or denial of its naturalness and permanence. *Aging-in-place is applied claustrophobically to "inside the four walls of a home." Two recent posts on UD speak to these points in complimentary ways. When we focus only on accommodation, rather than universal benefit, we unfortunately undermine the full promise of UD. As unpleasant as it is, the reality is that things that are seen solely as accommodations for those with disabilities will wind up being marginalized by a large proportion of the population. On the other hand, if the same designs are seen simply as "easier to use" they will get wider appeal and acceptance. Best to think of UD as a movement to create a more functional, flexible, intuitive and forgiving environment for all of us. If that were achieved, the need to make physical modifications to homes would be greatly decreased. Do you think of yourself as an elderly person who needs to remodel your home right now to accommodate a potential disability? No? Then perhaps you'd be willing to consider a home that would improve your health and longevity. For example, how can your home make it fun to exercise and to use healthy cooking techniques? What can you change in your home to prevent accidents? If you're remodeling anyway, would you consider hidden features that could be adapted as your abilities change? Universal design's features, sophisticated and often invisible, are enticing for boomers hoping to age in place. Universal design isn't separate from the rest of the house, done to handle a problem that has suddenly arisen. It's how you address your entire home when you're still healthy. Those who nestle into homes with a forward-looking view toward their aging bodies next turn to the details of aging actively. The "new normal" for home design becomes the basline they expect in hotels, restaurants, airplanes, and cruise ships. The inwarding-turning moment of transforming one's life at home through Universal Design is having a ripple effect on a generations lifestyle expectations as consumers, citizens, and travelers. WASHINGTON - A record 10,552 fair housing discrimination complaints were filed in fiscal year 2008, according to a report just released by the U.S. Department of Housing and Urban Development. The report, which is produced for Congress each year, shows that a large portion of the complaints, 44 percent, were filed by persons with disabilities. Thirty-five percent, or 3,699, of the complaints alleged discrimination based on race. "Despite progress, housing discrimination continues in America. We must put a stop to it and stand up for anyone who is unlawfully denied a home of their own," said John Trasvi?a, HUD Assistant Secretary for Fair Housing and Equal Opportunity. "Fighting against housing discrimination and affirmatively furthering fair housing are twin priorities of HUD and the Obama Administration." A loan modification for a Hispanic couple that included forgiveness of the entire amount of the second loan, approximately $75,000; provision of a 5 percent fixed interest-rate mortgage; and waiver of all closing costs, points, and fees associated with the loan modification. A $20,000 settlement for a mother who was denied the opportunity to rent a house because she had a child. A $40,000 settlement for a family with a disability that was denied a reasonable accommodation for their child. In addition, $2,500 was donated to an autism group and another $2,500 to an early childhood development center. In addition, the report also shows the importance of the partnership between HUD and its FHIPs, private fair housing groups and FHAPs, state and local agencies. "HUD has an array of weapons to combat housing discrimination," said Trasvi?a. "Most important are the partnerships with state, local and other agencies, private fair housing organizations and responsible industry officials who, together with HUD are on the front lines to advance fair housing and fair lending policies." People who believe they are the victims of housing discrimination should contact HUD at 1-800-669-9777 (voice), 800-927-9275 (TTY). Additional information is available at www.hud.gov/fairhousing. This time of year Downunder the main motivator for taking short holidays to nearby destinations may be weather rather than cost. The site itself is a world-class example of how to promote your own destination if Sydney is not home for you. See "How to Use This Website" for a discussion of the project. Wherever you are in the world Inclusive Tourism is good business. Where can you go for a short nearby holiday this season if you live in Sri Lanka? Here Dr. Ajith Perera talks about the potential of Sri Lanka. the vision and the will to embrace and manage 'Diversity of the Community' will enhance their business performance, fulfill customer delight and will soon prosper. On the other hand, physical obstacles to access goods, services and facilities, send an unintended but a big message of unwelcome," said Chief Executive/Secretary-General, Chartered Analytical Chemist Ajith C.S. Perera. 2 June 2009. In the recent case of Glor v. Switzerland, the European Court of Human Rights has for the first time (1) found a violation of the right to non-discrimination on the basis of the applicant's disability, (2) referred to the United Nations Convention on the Rights of Persons with Disabilities, and (3) used the human rights concept of "reasonable accommodation". In its judgment, the Court held that the Swiss government had violated Mr Glor's rights under Article 14 (prohibition of discrimination) in conjunction with Article 8 (right to private and family life) of the European Convention on Human Rights by levying a tax for exemption from military service to a person with disabilities who, because of his disabilities, could not carry out compulsory military service. The applicant, Swiss national Sven Glor, was deemed medically unfit to perform military service due to his diabetes. His condition, according to the Swiss authorities, posed a problem on account of the particular restrictions related to military service including limited access to medical care and medication, the significant physical efforts required and psychological pressure exerted. However, the authorities decided that Mr Glor's diabetes was not severe enough to relieve him from paying a non-negligible military service exemption tax on his annual earnings for several years to come. Mr Glor, however, actually wanted to carry out his military service, but was prohibited from doing so. He was not permitted to carry out alternative civil service, this being available only to conscientious objectors. Invoking Article 14 together with Article 8 of the European Convention on Human Rights, Mr Glor argued that he had been subjected to discrimination on the basis of his disability because he had been prohibited from carrying out his military service, and was obliged to pay the exemption tax as his disability was judged not to be severe enough for him to forgo the tax. In its judgment, the Court reiterated that Article 14 contains a non-exhaustive list of prohibited grounds, which also encompasses discrimination based on disability. Referring to its previous jurisprudence, the Court noted that an individual's physical integrity relates to the exercise of a person's right to private and family life as set out in Article 8. In the present case, a tax levied by the State which finds its origin in a person's inability to serve in the army due to disability - a state of affairs which is beyond the applicant's control - falls squarely within the reach of Article 8 of the European Convention even if the consequences of the measures are primarily monetary. In examining the arguments of the parties, the European Court of Human Rights found that the Swiss authorities did not fairly weigh up the interests of society and Mr Glor's human rights. In particular, the Court concluded that no objective justification existed in a democratic society to distinguish between persons with disabilities who are exempted from the tax and persons with disabilities who are obliged to pay the tax. In a second 'first', this judgment condemns the Swiss authorities for failing to provide reasonable accommodation to Mr Glor in finding a solution which responds to his individual circumstances. Echoing Article 2 of the UN Convention on the Rights of Persons with Disabilities which defines reasonable accommodation as the "necessary and appropriate modification and adjustments not imposing a disproportionate or undue burden, where needed in a particular case, to ensure to persons with disabilities the enjoyment or exercise on an equal basis with others of all human rights and fundamental freedoms", the Court calls for the implementation of reasonable accommodation by, for example, filling posts in the armed forces which require less physical effort by persons with disabilities. In highlighting the failure of the Swiss authorities, the Court points to legislation in other countries which ensure the recruitment of persons with disabilities to posts which are adapted to both the person's (dis)ability and to the person's set of professional skills. In a third 'first', the Court makes explicit reference to the UN Convention on the Rights of Persons with Disabilities as the basis for the existence of a European and universal consensus on the need to protect persons with disabilities from discriminatory treatment. It does so despite the fact that Switzerland has not yet signed the disability-specific Convention, indicating that the Court values the Convention as an. up-to-date expression of equality globally. For further information, the Glor v. Switzerland case (Application No. 13444/04, judgment 30 April 2009), which is available only in French, is accessible here. The word "independence" means many things to many people. More than just a word, independence is a feeling that holds a special meaning to each and every one of us. With that said, we want to hear from you. In 350 words or less, "What Does Independence Mean to You?" It can be your own personal story of triumph and determination. Maybe it's about the obstacles you faced and how you overcame them. Tell us your Independence story. Shyamala takes us through a Universal Design process with three personas at her post "Universal Design"
While designing, we need to keep in mind all set of users and this is where the concept of "Universal Design" comes into picture. The word "universal design" may seem simple, but it holds lots of concepts, principles, techniques and process from a designer's and end-user's perspective. Let's understand universal design in detail. Irrespective of age, ability or disability and situations, every has the right to effectively use any products or services, hence designers should always be conscious about this fact and implement their design ideas to serve one and everyone. This is what universal design means. The work we have done in Asia through ICAT 2005 and ICAT 2007 is set on the rights-based approach that was ultimately codified in Article 30 of the UN Convention on the Rights of Persons with Disabilities. It is encouraging to see a user interface developer and search engine optimization specialist like Shymala extrapolating from the virtual to the concrete world in the three examples she gives in here article. It is an extra bonus to see her bring the argument full circle to ground the theoretical in a vision of justice with a short article introducing a set of questions reaching beyond the questioner's body experience, a set of principles produced by those with the body experience being queried, a design process, examples of best practices. Yes, Shyamla is right. Justice is what Universal Design is about - a justice that benefits all because it preferentially invests human appreciative inquiry, design process, and manufacturing toil specifically on the disability community. That is intelligent and affirmative action. Sharon Rickman, a retired computer programmer, was diagnosed with multiple sclerosis 17 years ago. Since then she has been afflicted with limericks, the result of a mind more active than the body. With a devoted husband and three grown children, she finds writing poetry more therapeutic than programming computers. Which, in my case, could take me all day. I said "I'm sorry to see you're handicapped." She says "What makes you think a thing like that?" And she says, "You want to drag?" But coming down she'd sail on by! She says "Not bad for somebody ablebodied. You could be taught simple tasks. So how about something to eat?" "We're near a favorite place of mine." They are also involved a project with important crossover to the portion of the Inclusive Tourism community engaged in tourism as a contributor to disability and development work: Mobile Literacy - Designing Mobile Technology for Emerging Markets. Regardless of culture, humans have a set of finely honed senses - touch, auditory, visual cognition - that allow us to understand and interact with the world. Unfortunately these senses are overlooked in most technology experiences designed today. The mobile device landscape is dominated by visually-driven interfaces that require reading comprehension to use. Explore and privilege interfaces and interaction models that engage these dormant senses. The Adaptive Path project is ripe with a variety of opportunities for review from a disability-aware perspective. For example, it complements directly the Geotourism Challenge entry on Inclusive Tourism by uniquely addressing the key issue of systems of reliable information in making travel decisions. These workarounds underscore a key problem with mobile devices in emerging markets: the interface conventions used to guide people through mobile experiences are largely misunderstood by a large portion of the world's population. Honor the Culture of Relationships. Understand how people in the market are going to use the device or service to communicate or get information, by seeing what they do now. Design for Cultural Relevance. Support existing needs, values, networks and experiences. Design for Today's World. Resources in rural India are scarce, and people manage them carefully. Systems and services familiar to western cultures simply don't exist. Designing a solution to fit existing infrastructure and cultural experience is essential to its success. Design Legos, Not Model Car Kits. Giving people a flexible toolkit of parts rather than a prescribed solution to a one problem opens up opportunities for cross-cultural iteration. Leapfrog the PC. More than a phone, mobile devices present the opportunity to invent new ways for people to access and interact with information. Generate Awareness & Adoption. Creating mechanisms for facilitating awareness and adoption helps to ensure that all who can benefit from a device or service are aware of and able to use it. The original project focuses on rural India and rural culture. We hear resonances of the core disability culture value "interdependence" in their elaboration of the principles. Giving people a flexible toolkit of parts rather than a prescribed solution to a one problem opens up opportunities for cross-cultural iteration. Instead of forcing people to wait for outsiders to introduce solutions to local problems, creating systems that leverage local knowledge and abilities enables progress to happen more rapidly and collaboratively. To create devices and services that cut across cultures and address needs we might never have anticipated, we must create flexible and adaptable systems that address known needs while being open-ended enough to support novel usage. The system should rely on organization principles, communication methods and iconic representations that are relevant to local experience. Recognize the cultural norms of verbal communication and spatial memory. Poverty and inadequate infrastructure in rural areas, together with lack of healthcare, transform treatable conditions into chronic disabilities. The disproportionately large incidence of disability in rural settings is a cultural reality not addresses in the Adaptive Path study. Interdependence is the cultural technology of disability used to provide resilience. In rural societies with strong family networks interdependence is ubiquitous. Its role can be overlooked. In Western individualized societies interdependence has been preserved and refined by disability culture as a resistance strategy where attitude, environment, and designed objects conspire to exclude those who experience disabilities. If Adaptive Path is successful in applying its insights on cell phone usage to cell phone design we may finally see a fracturing of the "solid wall of (inaccessible) design." Taking on the challenge to the status quo is Rachel Hinman in a post that is interesting both as an essay on design but also as a sort of intellectual travelogue chronicling an urban Westerner's encounter with rural resiliency. A historian of the explosive diffusion of technology (via rural culture) across Europe in the Middle Ages following the fall of the Roman Empire could find rich data in her experience for documenting a similar phenomenon today. A Disability Studies scholar would hope for more information on how disability culture explicitly shapes the overarching rural culture of the area where she researched. Notice her choice of "Steampunk" to illustrate what rural culture in America refers to as "handiness" (As in "He's pretty handy with that oxy-acetaline torch") - tinkering, repurposing, American ingenuity. Examples of such engagement and invention abound in disability culture: Jesse Owens, Mark Felling, or Jessica Zarin Kessin. Steampunk became the conceptual wrapper for the mobile device we envisioned. Steampunk enthusiasts create work that reflects the design and craftsmanship of the Victorian era. Similar to the exaggerated physical interface elements found on objects modded by Steampunk enthusiasts and artists, we designed a mobile device that celebrated physical interface elements like knobs that turn, scroll wheels, and exaggerated buttons. Removing the aesthetic of "preciousness" was a key design goal for this phone. Most modern pieces of technology like computers, phones, and televisions convey a sleek aesthetic that does not invite tinkering and exploration. Steampunk aesthetics applied to modern objects like computers and electric guitars triggers a different emotional response. Similar to the exposed inner workings of a motorcycle, works of art created to reflect the Steampunk genre possess a look of craftsmanship and cobbling. It's an aesthetic that invites the touch of the human hand and it encourages engagement and foster curiosity and play. In this May 2009, Vol 4, No. 5 issue, we bring you the second part of the book Universal Design @ San Francisco State University, very ably put together by Prof Ricardo Gomes. The first paper 'Designing to Live: The Value of Inclusive+ Universal' is by Prof Ricardo Gomes. The paper corrects and enlarges our earlier understanding built around 'Living by Design'. It explores the importance of designers working with communities, responding to constraints, and maximizing ownership of users and other stakeholders? The new paradigm shift in expanding the role of designers in the 21st Century will continue to promote exemplary projects with an emphasis on participatory design, universal design and social responsibility. It will lead to 'Designing for majority' and Designing by Majority' and ultimately to the 'Democratization of Design'. This work is an excellent reflective research output of his design sabbatical immersed in Brazil. It is rooted and emerges from the wider reality of Latin America. The second paper also from Ricardo "Inclusive Design in the "Majority World" Designing for the 21st Century Student Design Competition was a call to young design visionaries who appreciate the creative power of design for real people in real places. 200 student teams registered for the international student design competition from 41 countries. There were 14 jurors from across the world. The competitors were required to bring together Universal Design, Sustainable Design, Low cost and Design Excellence while addressing the practical needs of the "majority' world on an equitable scale. Design for All India Newsletter - Download the full issue here. Osooyos, British Columbia: Getting Ready to Roll! Osoyoos (officially pronounced /? ?su?ju?s/ os-SOO-yoos; commonly mispronounced /??s? ?ju?s/ ?-SOY-yoos) wants to become one of the destinations of choice for people with disabilities. Let me register my vote in the "Yeah!" column. Wikipedia lists this lakeside community as being often the hottest summer locations in Canada. What a great place for landlocked Canadians to set up a Sailability or Disabled Sailing Association group, accessible beaches, trails for slow walkers and wheelchair users. The rural setting leaves open the possibility of horses and hippotherapy, wheelchair accessible hot air balloons, or just a convenient hotel or retirement properties that fully adopt the principles of Universal Design. Next on my accessible Okanagan wish list: Kelowna and Penticton. The National Association of the Remodeling Industry (NARI) announced two new certification programs. The Universal Design Certified Remodeler (UDCR) and the Master Certified Remodeler (MCR) will both launch in the Fall 2009. The UDCR certification correlates with the Universal Remodeling Course and recognizes remodeling contractors with expertise in applying Universal Design Principles to residential remodeling projects. The MCR program will recognize those individuals with minimum of ten continuous years as a Certified Remodeler (CR), have at least one additional current NARI certification (CKBR, CLC, or GCP) and have demonstrated chapter, community, and/or remodeling industry involvement. Consumers can also call the NARI National hotline at 800-611-NARI and request a free copy of NARI's brochure, "How to Select a Remodeling Professional," or visit www.nari.org or www.RemodelToday.com and click on the homeowner's guide for more information. El candidato a intendente por el Partido Popular, Pedro Braillard Poccard, llamo a sus competidores a firmar un compromiso público sobre "Políticas de accesibilidad Universal", referidas a la "falta de infraestructura" en lo corresponde a las personas con capacidades limitadas. La clase política capitalina debe tomar conciencia de que hay cuestiones que deben ser políticas de estado, gane quien gane en la próxima elección" dijo Poccard. Consultado sobre la iniciativa el candidato explicó que "una problemática que aqueja a un gran porcentaje de poblaciones correntina, es la falta de infraestructura en lo corresponde a las personas con capacidades limitadas". "Uno no se da cuenta pero muchas veces la discapacidad está provocada por la sociedad, pues la exclusión social que experimentan son causa de no tener en cuenta la planificación y no por su particular condición física", dijo. "Es fundamental que pensemos en una ciudad más sensible que los correntinos nos empecemos a querer y respetar mas, hagamos cosas que la infraestructura que creemos trate de abarcar así a todos los posibles usuarios beneficiando de esta manera al total de la población", se?aló. Para Poccard "la arquitectura en la ciudad de Corrientes debe empezar a pensar en la accesibilidad como premisa básica de un buen producto final y reconsiderar que los espacios públicos deben encontrar la manera de incluirnos a todos los individuos". "1) Igualdad de uso: El dise?o debe ser fácil de usar y adaptado a todo tipo de personas. 2) Flexibilidad: El dise?o debe adecuarse a un amplio rango de preferencias y habilidades individuales. 4) Información fácil de percibir: (el dise?o debe ser capaz de intercambiar información con el usuario sin importar las condiciones sensoriales del mismo). "Debemos tomar conciencia de esto todos en algún momento de la vida tendremos problemas de discapacidad temporal o permanente. Tengamos en cuenta que la problemática también aqueja a; adultos mayores, personas de corta estatura, personas obesas, mujeres embarazadas", dijo Poccard. View more OpenOffice presentations from Scott Rains. E-Book Ubiquity - But Will They Be Accessible? Computerworld - E-books may have been a niche technology so far, but Google Inc.'s entry into the market could burst the online business wide open. The giant search engine company wants to give publishers a way to sell online digital books through a partner program by the end of the year. What may be most important in today's news is that Google wants to allow partner publishers to to make their books available for purchase from any Web-enabled device. That means a user could use any smartphone to download e-books, although some users of Amazon Inc.'s Kindle and the Sony Reader say smartphone screens are too small for prolonged reading. To be honest, the space is crowded with direct and indirect competitors like Where I've Been, Joobili ( ), GeckoGo, Wikitravel and SpottedByLocals, the 2008 winner of our Open Web Awards. This doesn't mean that there isn't room for Nextstop, but it faces a steep hill. Yet we're thoroughly impressed with our first run of Nextstop. Guides are actually quite useful, and there are hundreds if not thousands of guides already built by users, mostly because it's so incredibly quick to create a guide. It's a well polished website with very few issues, although I will say, I really want a better way to bookmark and organize guides I like for later reading. It easily has the community feel as well. In other words, if you are looking to get the inside scoop for your vacation or want to share your knowledge, NextStop is a smart way to go. It's already made itself a very useful tool. Whether it will catch on is an entirely different question. Attached is a photo of Maya Aboul-Hosn, Senior Executive Officer of the Dubai International Award, Mukhtar Al Shibani, Vice President of GAATES and me - accepting the award. It was so exciting - I told them that the award was celebrated by people all around the world who have dedicated their lives to the promotion of accessibility. St. Paul, Minn., June 1, 2009?AbleNet Incorporated, a global leader in the design, development and manufacture of assistive technology products, software and curriculum for people with disabilities, launches its third party funding program to help customers access funding from private insurance providers. Insurance coverage is often available for many of the augmentative and alternative communications (AAC) devices, access solutions like switches, as well as mounting system for beds and wheelchairs are now offered by AbleNet. Insurance providers, however, vary widely in their requirements to receive funding for assistive technology devices and the process is often complex. ?At AbleNet we are excited to be in a position to help our customers navigate the complex process of getting funding from private insurance,? said AbleNet President and CEO Jen Thalhuber. ?The AbleNet products are often covered by these third party organizations but the documentation and other reporting requirements are overwhelming and very time consuming. We feel it is important for us to help our customers with this process.? The AbleNet funding program is an important resource to assure access to funding coverage. The experts will help guide practitioners and customers through the numerous documents required and the specifics of the application process. Ultimately, the user gets their needed assistive technology equipment, which will significantly improve their quality of life and productivity. AbleNet is an international company and industry leader in providing educational and technical solutions to help children and adults with disabilities lead productive and fulfilled lives. This includes a complete line of communication aids for nonverbal individuals; access aids, such as switches and wheelchair mounting devices for people who require physical supports; and special education classroom curriculum and software that both enhance and help ensure learning progress. The products are offered in more than 60 countries and used in hundreds of thousands of classrooms in the United States and across the globe. AbleNet is an ESOP company located in Roseville, Minnesota. For more information, visit www.ablenetinc.com. Andrea Kennedy writes the Colorado Adaptive Travel column at Examiner.com. Right now she is in Miami for the 2009 No Barriers Festival. The No Barriers Festival started in Turin, Italy in 2005, hit Lake Tahoe California in June of 2007, and will now be in Miami this weekend at 2620 South Bayshore Drive, Coconut Grove, FL in conjunction with Shake A Leg Miami, a local adaptive sailing and watersports program. Although this is out of my location, it's worth mention just to pass it along to your Florida friends in the area; it's a truly AMAZING event. We volunteered and participated in the 2007 event and kayaked, handcycled, rock climbed both on a free wall and on Donner Pass, checked out the scuba tank, painted with Luanne (80% blind), tested the heights of the ropes course, mountain biked, hiked, camped... and met some amazing, inspiring people like Hula John who'd lost both arms in a factory accident and some of our valued wounded soldiers as well.